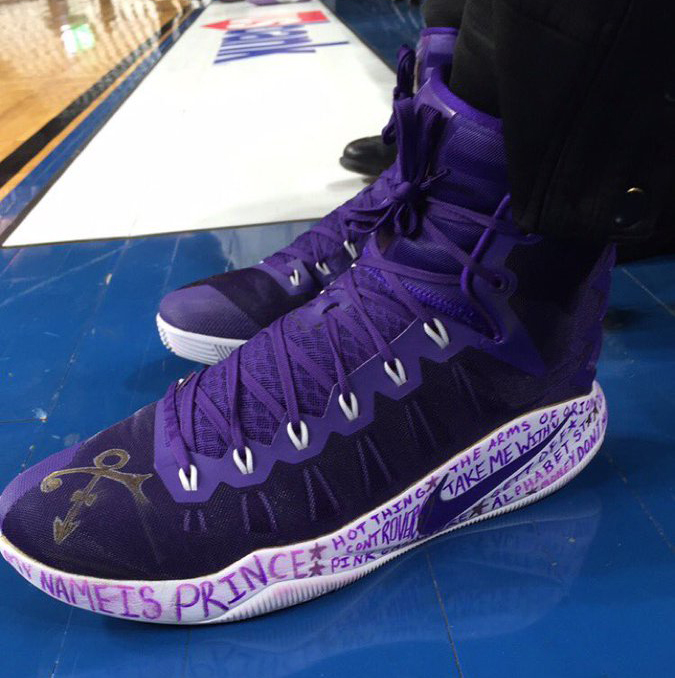 Awesome Prince sneakers from the Minnesota Lynx. A flood of purple footwear hit WNBA courts on Wednesday, with the Minnesota Lynx honoring Prince via custom sneakers. Worn by players like Seimone Augustus and Sylvia Fowles were the Kyrie 2s and Hyperdunk 2016s seen here. Note that the shoes aren't proper player exclusives from Nike, but rather custom versions of existing shoes made to pay tribute to Prince, who hails from Minnesota. Custom designs included Prince's symbol and lyrics from his songs. Also donning one of these sneakers was Jordan Brand athlete Maya Moore, whose Prince purple Air Jordan 31 surfaced online on Wednesday before the game.